Date Night is stuffed with turkey from Thanksgiving and we need an antidote. We decide that burgers are the way to go tonight. Throw in a little moonshine, and we could have the makings of a fun evening. Stillhouse has been open since the end of August, and in three short months it has shot to the top of the Urbanspoon most popular chart. 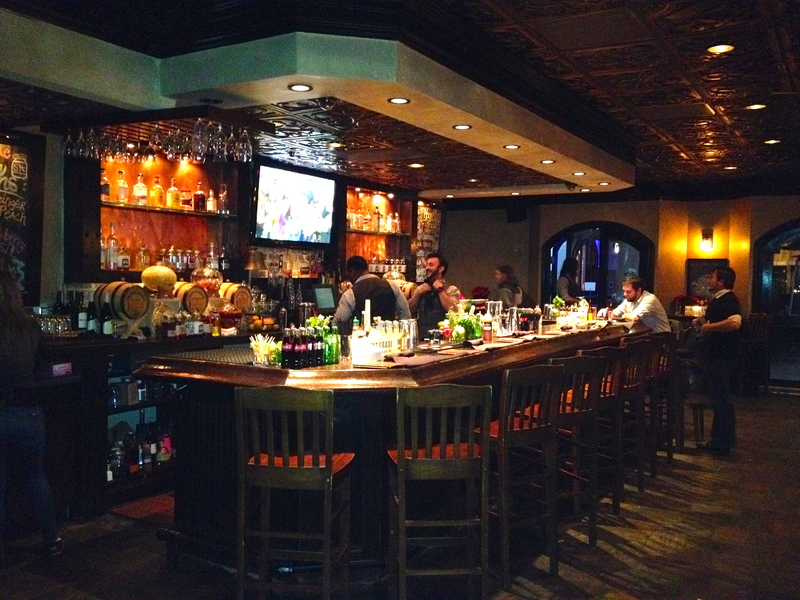 It’s located in the Andrews Entertainment Complex in Buckhead, which also houses a wine bar and a vodka bar. You could do some serious damage to your liver here. And speaking of our livers, let’s have a drink! We are joined tonight by our son Elliott, home from college for the holiday break, which is why you see three glasses here. Elliott wants to try the moonshine and orders and Old Fashioned made with moonshine and orange bitters. You can get many versions of moonshine here. They infuse it with wood or with fruit. Not wanting a headache in the morning, we stick with beer tonight. 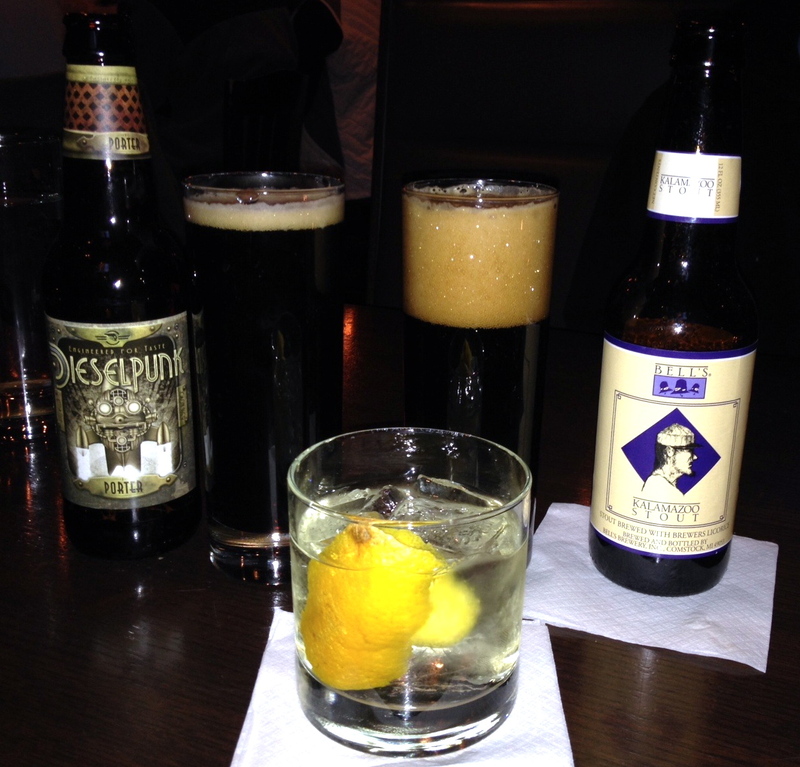 From the list of ten craft beers, we choose a Dieselpunk Porter and a Bell’s Kalamazoo Stout. The porter has a lot of caramel malts, but hits you with coffee when you first taste it. The stout has coffee flavoring as well. There is a nice bar on one side of the room. 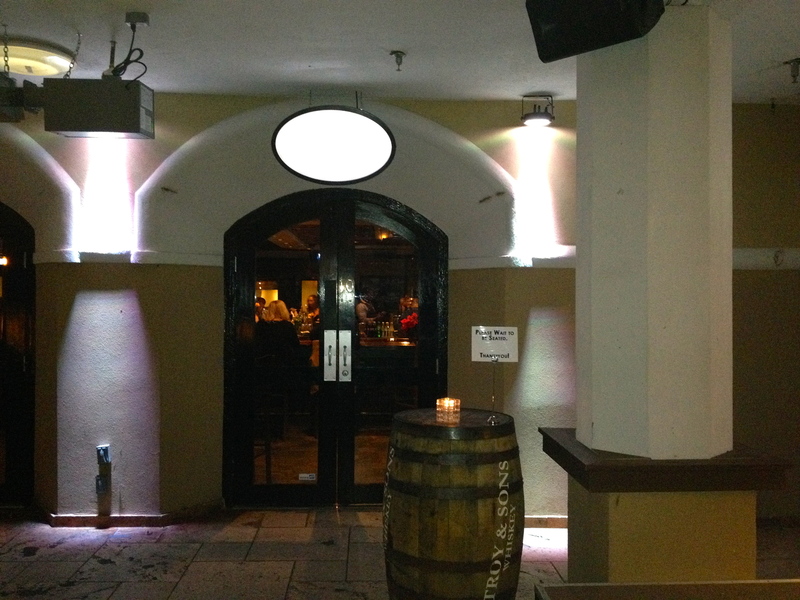 The seating area is across from the bar. It’s not huge, and it is full on this cold Friday night. The menu is very southern. From boiled peanut hummus to deviled eggs, you can get a good dose of southern favorites for your appetizer. 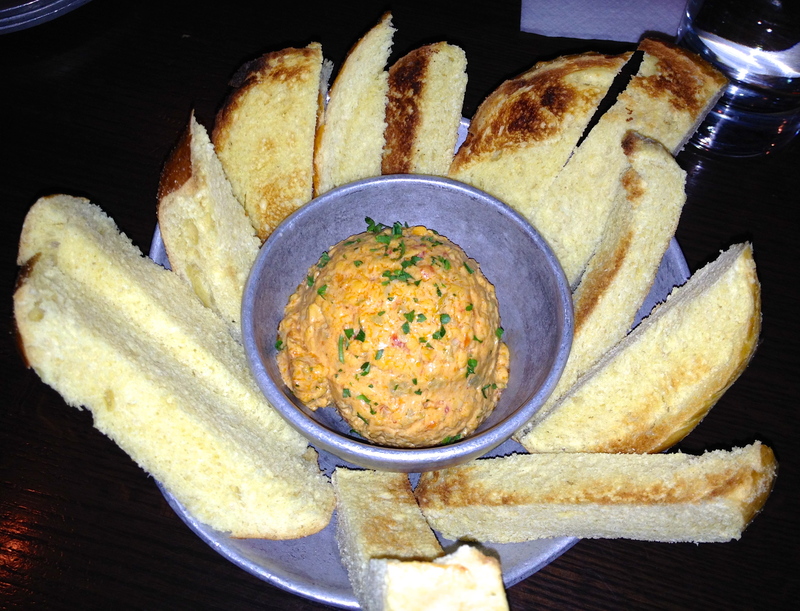 We choose the pimiento cheese, which has a bit of a kick to it. 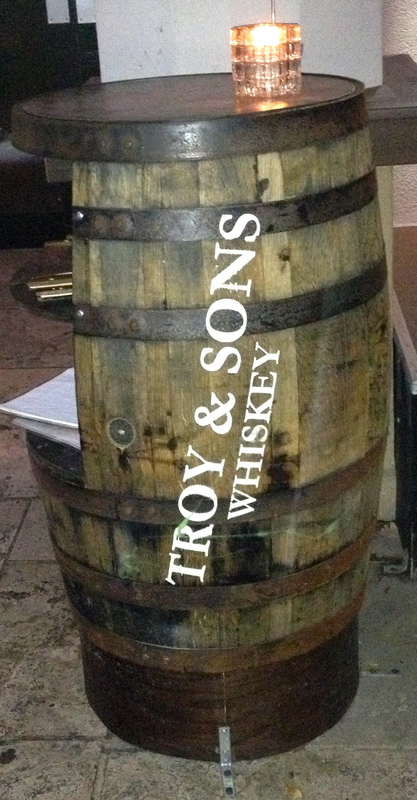 It comes with toast and is a nice compliment to our drinks. Tonight’s server is Leann, who knows her menu and walks us through it. There is a long list of 14 different “craft burgers”, from beef to veggie to pork to duck. 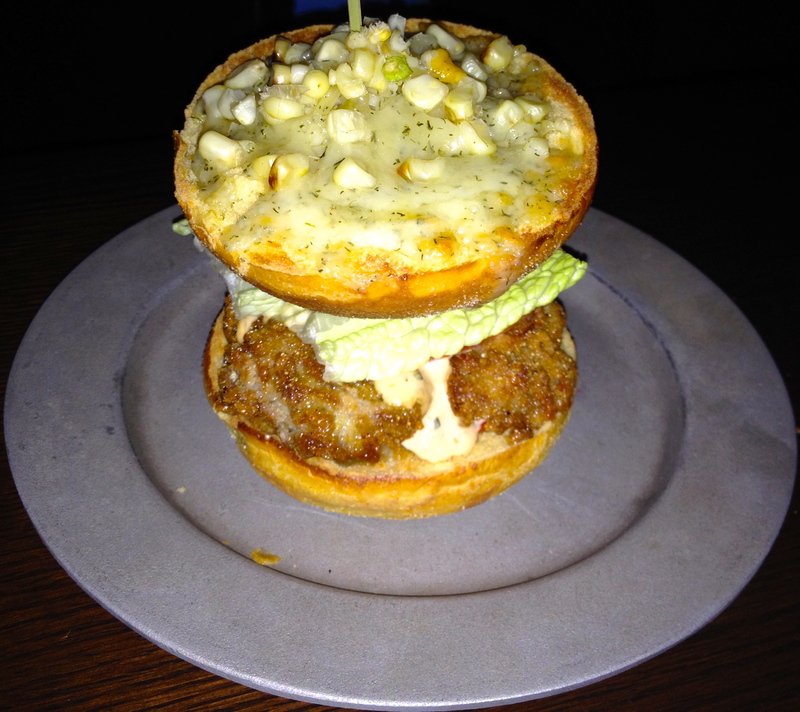 As we shall see, the definition of a burger at Stillhouse is not necessarily a patty on a bun. Elliott orders the Fried Oyster Burger. 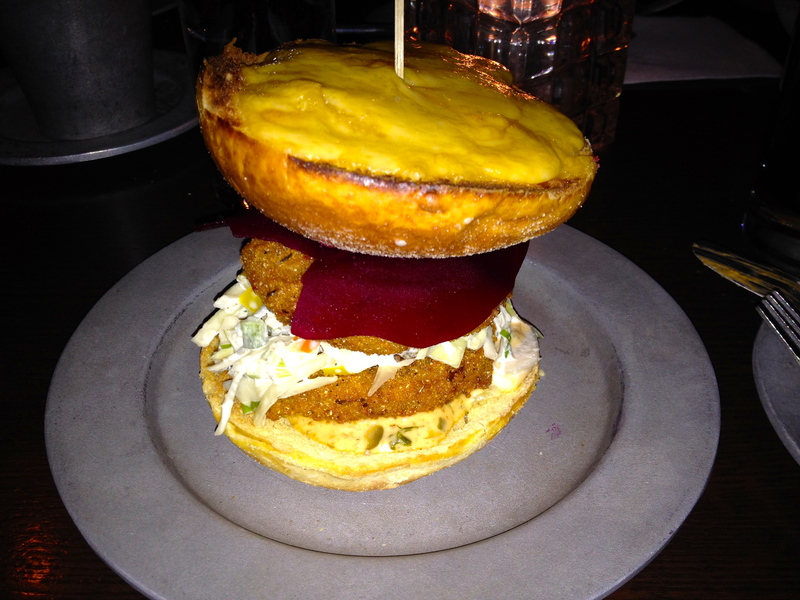 The top of the bun comes “upside down” at Stillhouse to better showcase the toppings. You remove a long toothpick, invert the bun, and viola, you are ready to eat. As for the oyster burger, it has just oysters on it, no meat, so we aren’t sure that you can call it a burger. Elliott reports that the burger is very good, but it could have used a couple of more oysters on it as it was more bun than “burger”. Eve orders the Fried Green Tomato Burger. It arrives with two fried green tomatoes, a big chunk of beet and cheese. She enjoys this burger, but she erroneously thinks it comes with meat. You can order a meat patty with your burger for an extra charge. Both of my companions wish they did. My burger comes with two duck patties. 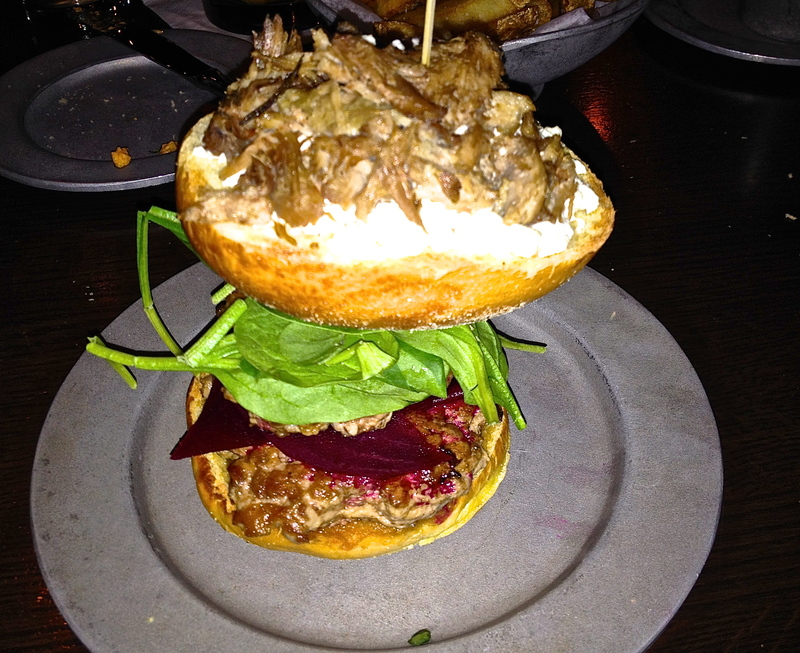 The Skeeter Branch Duck Burger comes with pickled beets, spinach, along with goat cheese and duck confit on the inverted bun. The beets act like a catsup as I bite into the burger, which is excellent. I have ordered the best dish of the night. There are fries and side dishes on the menu as well. We get our fries straight, although we could have ordered them with either cheese or gravy. Sides range from greens to cole slaw to cream corn. We get the Spicy Macaroni and Cheese. 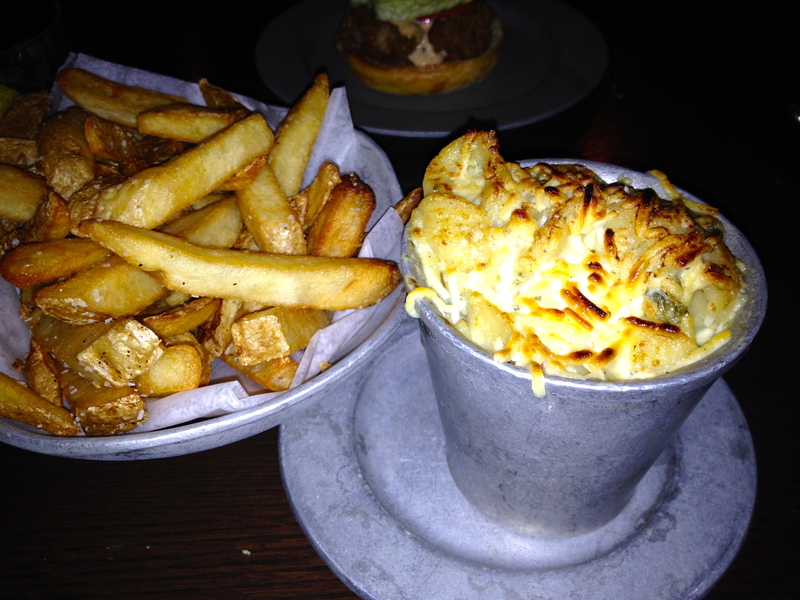 There are poblano peppers in the mac and cheese, but surprisingly, the pimiento cheese is spicier tonight. Somehow, we have room for dessert. 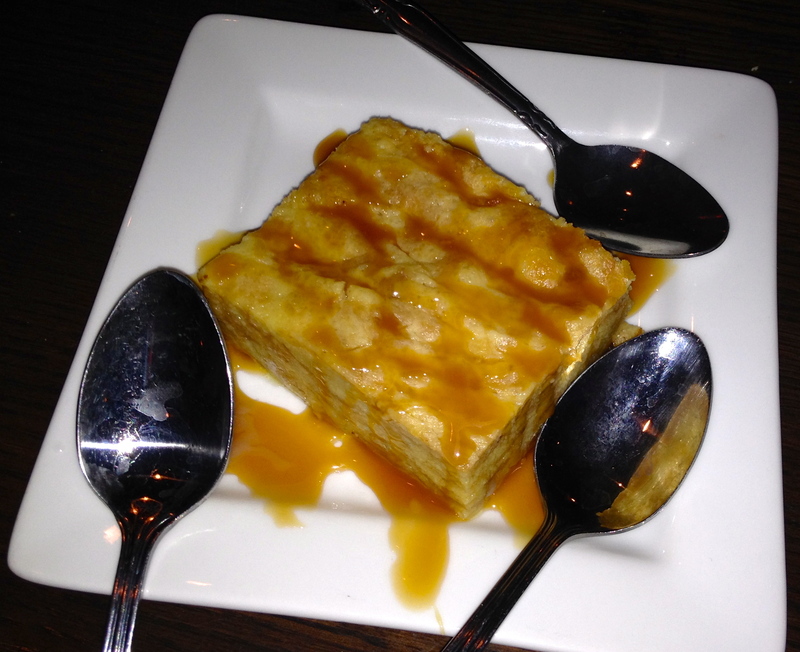 What’s more southern than Krispy Kreme Bread Pudding? Yes, it tastes just like a donut with caramel sauce. It’s a nice way to end tonight’s festivities. 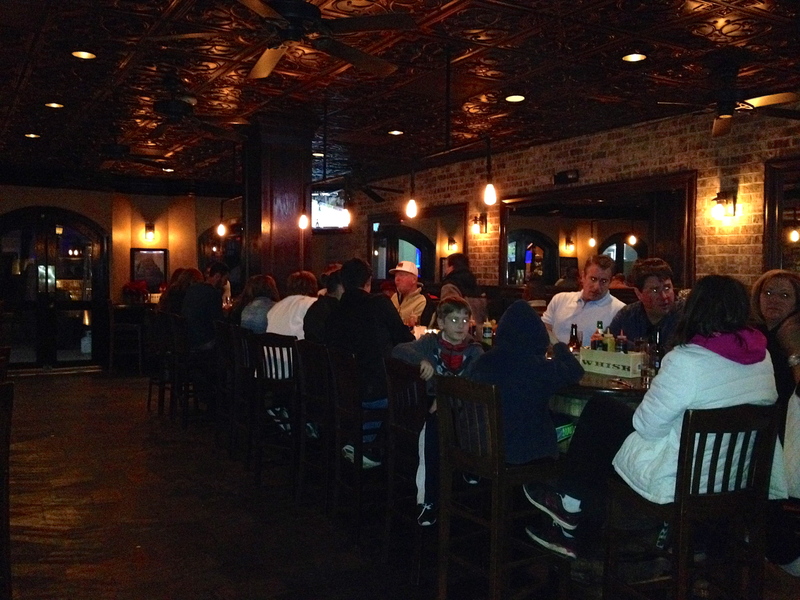 The Bottom Line on the Stillhouse: We were impressed by the selection of burgers on the menu. There are some very creative choices on the menu, including a steak and eggs burger with deviled eggs and a pork burger with pork patties and pulled pork. Order carefully, though, so you don’t just end up with a tomato sandwich. We are not big moonshine fans, but we still had a good meal at the Stillhouse. If you like “hard likker”, check it out. Money saver alert–there is a Scoutmob discount there as we speak!